A recent Pew Research Center survey asked Americans of all races how black people are treated relative to whites by the police, the court system and other institutions in their community. The results show a large and consistent black-white gap in perceptions, with blacks far more likely than whites to say African Americans are treated less fairly than whites. Survey respondents were asked about seven specific institutions or realms of community life: the police, the court system, the workplace, stores and restaurants, public schools, the health care system and elections. If responses to all seven items are added together, half of whites (49%) do not see unfair treatment in any of the seven areas, compared with 13% of blacks who say this. 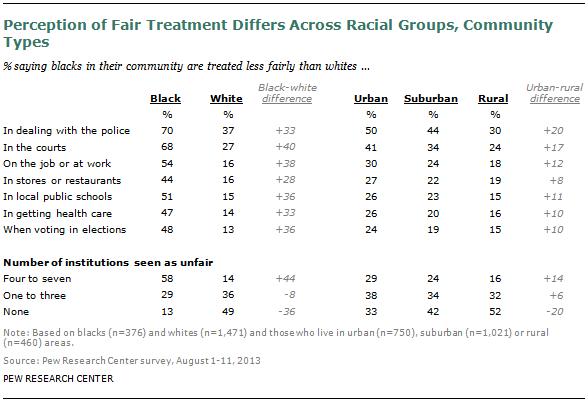 On the other hand, 58% of blacks say at least four of these community institutions are unfair, compared with just 14% of whites. Perhaps most notably, on the 50th anniversary of the March on Washington, we found few differences in perceptions based on geography. Among all respondents—regardless of race—whether he or she lives in the South or Northeast, Midwest or West did not make a difference in one’s perception about fair treatment of blacks. Among whites alone, there is only one significant difference: those in the South are more likely than those in the Northeast to say that none of their community institutions treat blacks less fairly than whites (53% vs. 43%). But there were wide variations in perceptions based on whether one lived in a city, the suburbs or a rural area. Adults who live in urban areas, regardless of their race, are much more likely than those living in rural areas to see racial inequality in each of the seven institutions, with gaps ranging from eight percentage points (in stores or restaurants) to 20 percentage points (in dealing with the police). Suburban dwellers fall in the middle of these two groups. The gap in perceptions between urban and rural residents is widest when it comes to the treatment of blacks in the criminal justice system. Half of all urbanites say blacks are treated less fairly than whites in dealing with the police, compared with just 30% of rural residents. And a similar gap emerges regarding the courts—about four-in-ten urbanites (41%) see racial bias, compared with about a quarter of those who live in rural areas (24%). 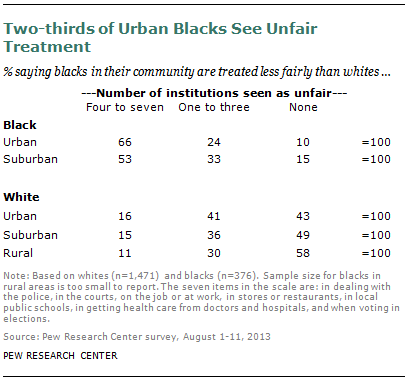 Urban residents are also more likely than suburban residents to say blacks are treated less fairly than whites in each institution except local public schools, which the two groups rate roughly equally. However, the gaps between urban and suburban residents are markedly smaller than the gaps between urban and rural residents, ranging from about five to seven percentage points. When all seven items are combined into one measure, about half of people who live in rural communities (52%) say none of these institutions treat blacks less fairly than whites in their community, compared with 42% of suburbanites and just a third of urbanites who say the same. And while similar shares of urbanites and suburbanites see disparities in the treatment of blacks in at least four of these institutions (29% vs. 24%), the share of rural residents who say this is much smaller (16%). The community-type gaps hold even when looking at blacks and whites in each community type separately. Rural whites are particularly likely to say that none of their community’s institutions treat blacks less fairly than whites—58% of rural whites say this compared with 49% of suburban whites and 43% of urban whites. Conversely, whites living in urban or suburban areas are more likely than whites living in rural areas to say that three or more of their community institutions treat whites and blacks differently (26%, 22%, and 16%, respectively). Relatively low shares of blacks in urban or suburban community types say that none of the institutions treat blacks less fairly than whites (10% and 15%, respectively). But while two-thirds of blacks in urban areas say four or more of the institutions in their community treat blacks less fairly than whites, the share is markedly lower among blacks in suburban areas (53%). The sample size for blacks in rural areas is too small to provide reliable estimates.